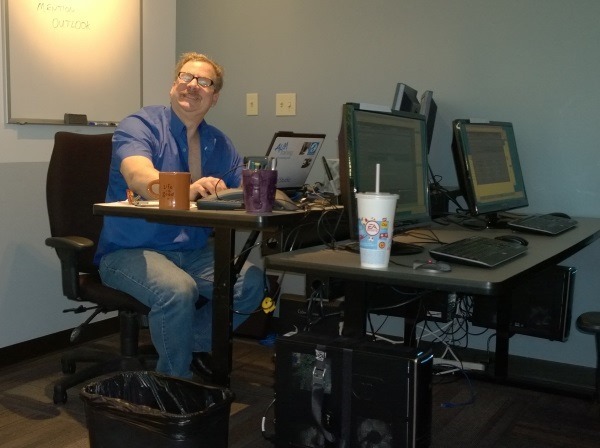 During the first run of our new Build, Release and Monitor software with Visual Studio 2013 course this week we had a special guest presenter for the topics of Application Insights and Cloud Load Testing. The course was a huge success and will be a regular part of our TFS 2013 schedule. Check when this course is running next. Here’s a couple of comments from students on this course. As the TFS courseware author and lead ALM trainer for QuickLearn, I work hard to try to make sure our eight TFS 2013 courses are best of breed. Students who attend our training are often doing so not only for the skills and knowledge to help them do their job more efficiently, but quite a few are also attending the course as preparation for the Microsoft ALM Certification. This morning I opened my inbox to find the following email from a student I had on one of our courses two weeks ago. I took exam 70-496 today and passed. This was due to your excellent coverage of the myriad of detail required for TFS Administration and use. I recommend your courses to all who wish to be successful with TFS. While I am in this profession because of my passion for helping people succeed, getting this feedback is also very rewarding. Thanks for letting us know how you got on with the exam Tom and congratulations on passing the exam. I hope to see you again when you’re studying for the next exam. QuickLearn is committed to the ALM community and have signed up as Gold Sponsors for the upcoming ALM Forum Seattle 2014. You can win a free ticket (valued at $ 1,895) to the ALM Forum Seattle on 1st-3rd April 2014. We have two free tickets to give away to lucky readers of our newsletter. We’ll be announcing details on how to enter the draw in our newsletter. If you’re not a subscriber, you can sign up from our community page. Come and see us at our booth and learn about the world’s most comprehensive TFS training curriculum. We’ll have two of our TFS trainers available to discuss your training requirements. You can also go into the draw from some great prizes including the Lenovo 64Gb Thinkpad 8 Tablet. This amazing device was a true standout at the CES conference in Las Vegas earlier this year! Since the official release of Visual Studio Team Foundation Server 2013 in November we’ve been testing our newest course updates and we’re pleased to be launching our new 2013 courses at the end of this month. If you either working with, or thinking of working with Microsoft’s latest release then you should take a look at the following courses. You can find out more and register for these course on our dedicated TFS 2013 page. We’re also planning on releasing an additional three TFS 2013 related courses in the coming months. QuickLearn’s lead ALM instructor and curriculum author, Anthony Borton, will be presenting a one day hands-on pre-conference workshop at the ALM Forum in Seattle in April 2014. The ALM Forum (previously ALM Summit) is a three day event focusing on all things ALM. There is an awesome cast of speakers lined up for this year including keynotes from Scott Ambler, Steve Denning and Ken Schwaber. James Whittaker and Dave West are delivering plenary sessions as well. The details of the pre-conference workshop are as follows. As a member of an Agile development team, you want to learn the best practices for setting up a new project on Team Foundation Server, so that your team can get the best possible start for delivering better software, more frequently. In this workshop, attendees will start by setting up a brand new Team Project on TFS 2013 and then proceed to configure everything required to get their team ready for their first iteration. To find out more or to register visit the workshop page. I am pleased to announce we have dates set for the first public run of our new Visual Studio 2013 ALM Training courses. These courses are available for you to attend in person in Kirkland, WA or you can attend using our online classroom infrastructure. If you need your team trained, we can also provide closed on-site courses for you. For additional dates, visit our TFS 2013 home page. QuickLearn’s first TFS 2012 Configuration and Administration course to run in London has just finished and we’re happy to announce that the course scored a staggering 96% customer satisfaction rating based on the course evaluations. Our trainer also scored a perfect score of 100% for both his knowledge of TFS and his presentation ability. Our next round of TFS 2012 courses in London includes the following courses. Our courses are run in London (Shoreditch EC2) but you can attend remotely from anywhere in the UK, Europe or Africa due to friendly time zones. Keen to find out more?